I have the gall to whine at a goddess about my difficulties resolving concepts of ‘Pagan’ and concerns about many, many of the practices of that community, and to wonder whether my strategy from here on in should be silence. And my Lady, who has called me to tell her stories and speak her name, came to me as a mighty giantess walking along the shore of Oileán Baoi in the early dawn, the hills of her island rising dark and strange behind her, the cold and death and rebirth of a coming November blowing the first winds of a storm across the dark water. Do you think you are a daughter of a queen? Are you from the tribe of great, remembered gods, their stories preserved by monks and monarchs? Do you speak of the chiefs and kings in your lineage, the castles your family lived in, the great wars they fought in, the great deeds they did? No. You run with the wild spirits of the most isolated, sidelined, liminal land in Ireland, with its poorest, most marginalized of people. You do not boast of ancestors with kingly lineage. You speak of the horrific suffering of your people: the good, very ordinary farmers, victims of famine and war and oppression, those whose backs were broken as the great, remembered men of Ireland climbed over them to reach their powerful place, and ate their food, and whose names they did not remember. Of the soldiers who fought the great wars the great myths tell tale of, whose deeds are ascribed to other, greater men, and whose names are not remembered. Of the women who watched their many, many children die, in famine and pestilence and at the brutal hands of English landlords, and carried on, whose names are not remembered. Of the road through the mountains that you love, that was built to carry food in one direction and bring coffins back, carrying the bodies of those whose names are not remembered. And even their stories are forgotten. 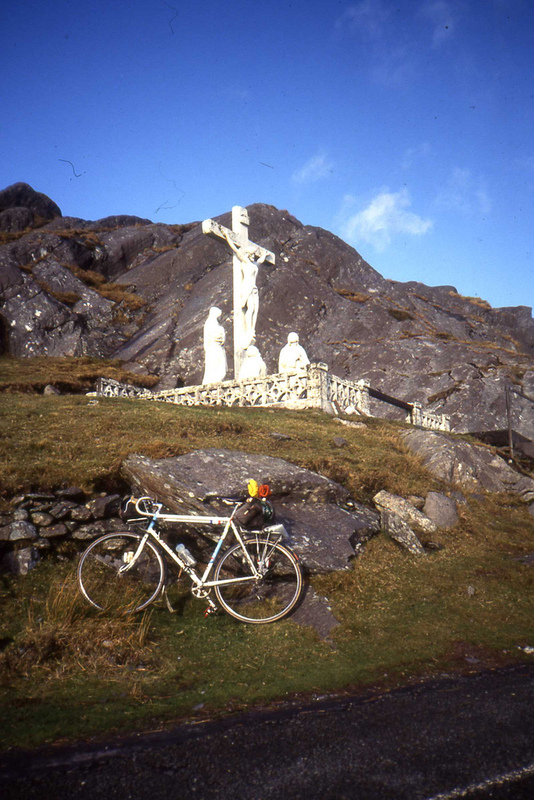 Memorial to famine victims at the top of the Healy Pass, the road through the mountains between Cork and Kerry. Once called the Kerry Pass, re-named for first president of Irish Free State. Photo: Sludge G. (CC). And this is the way you chose to walk. Then how dare you be embarrassed of the name you choose call yourself or the community you choose to draw around you? And how dare you be ashamed of a goddess whose stories are so deeply buried in the landscape that few remember her name? When few know of her sacred sites, or the stories of her cow and her lobster and her harvest, or have heard the songs the mountains sing in whispers about her? When many roll her lazily into the stories of her more renowned sisters, and forget the name of the One she is married to, and forget her island, and her mountainous country, and her dark shores? When so many do not remember her name? You are here to tell the unheard tales. The tales of the oppressed, those whom society crushes beneath their endless, vicious race to the top. The stories of the desperate, the despairing, the dying, the lost. The many who serve the few. Whose names are not remembered. Then open your mouth and speak. The long dark is coming, and my picture of a dark figure plunging a staff into the ground needs to move into the living room. It is not a picture of Her. And yet it is. And her name will be remembered, by those who choose to listen for it. 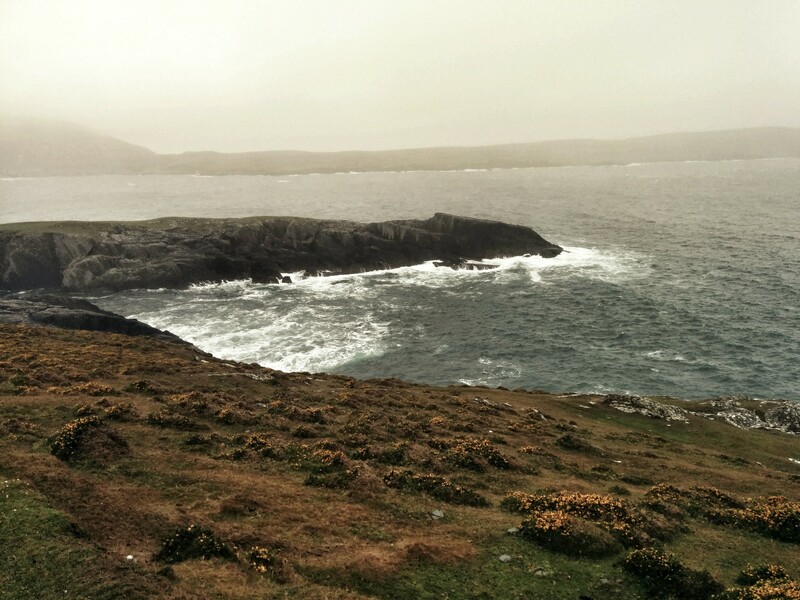 This entry was posted in Imbas, Social Justice, stories and tagged #write31Days, beara peninsula, cailleach bhearra, imbas, justice, stories. Bookmark the permalink. I shivered to read your insight . If she is a liminal figure she is always there, just off-centre perhaps because avoided, but at some time we must face her. As the shadows lengthen she awaits our attention. This is massively powerful. Your goddess’s words rise against the shame our society drives into us in walking a religious path, particularly in devotion to gods or goddesses who are liminal or little-known. Thanks for sharing them.